Vertigo is a sensation that you are moving or spinning when you know that you are not. Anyone who has experienced vertigo knows that it can be very frightening without a known cause. An abrupt onset of vertigo is often assumed to be a sign of a stroke causing fear and visits to hospital emergency rooms. The fact is that vertigo is usually a sign of an inner ear disorder rather than a stroke. The good news is that the most common type of vertigo called benign paroxysmal positional vertigo or BPPV is very easy to cure with proper diagnosis and treatment. Benign paroxysmal positional vertigo (BPPV) is called “benign” because it is a harmless condition not a disease that spreads. The vertigo is paroxysmal in its abrupt onset brought about by changes in head position and it lasts for less than one minute. The cause of BPPV resides in part of the sensory organs of balance in the inner ear called the semi-circular canals. There are three semi-circular canals that are filled with gelatinous fluid and sensory cells that sense head movements in three planes. These semi-circular canals attach to two otolith organs called the saccule and utricle that detect linear acceleration of the head with respect to gravity. 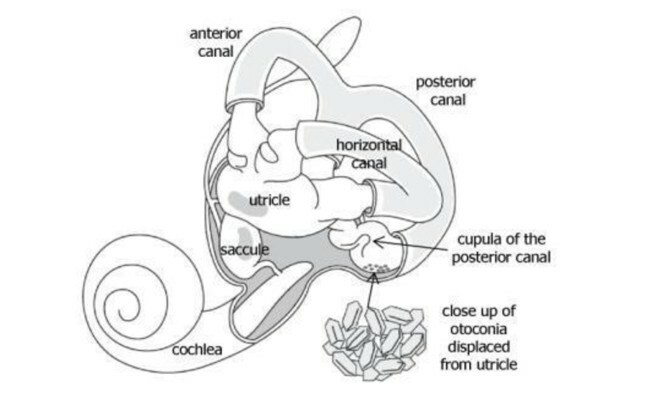 There are small particles of calcium carbonate called otoconia in the utricle that are believed to be the source of benign positional vertigo when these particles become displaced from the utricle and move into one of the semi-circular canals. How and why the calcium carbonate crystals become displaced are not completely known. Head trauma and viral infections have been implicated as possible causes. Bone demineralization is thought to have a role in producing this type of vertigo based upon the higher incidence of BPPV in patients with osteopenia and osteoporosis. BPPV occurs with head movement and is usually the most severe when moving the head backward to look up or when bending forward to look down at the floor. It may also occur when lying down in bed or turning in bed toward one side. The vertigo stops within a minute while in the same position. It often recurs when changing positions but will stop if the position is maintained for at least one minute. The vertigo can be severe and cause nausea and vomiting despite its short duration. BPPV can resolve spontaneously but it is more likely to recur without prompt treatment. Therefore, it is important to contact your physician to be evaluated for positional vertigo while you are symptomatic. Your physician may recommend a balance test called VNG (videonystagmography). This evaluation is performed by audiologists who record your eye movements to detect “nystagmus” (rapid involuntary eye movements) that occurs with onset of vertigo. The pattern of nystagmus provides the audiologist with information regarding the ear and the semi-circular canal causing the BPPV. Once BPPV is diagnosed and the ear of the disorder is identified, treatment can begin. Treatment involves moving the patient through a maneuver to reposition the otoconia out of the semi-circular canal and back to the vestibule. This therapy is best done under medical supervision initially. The repositioning maneuver eliminates vertigo immediately in over 85% of cases. 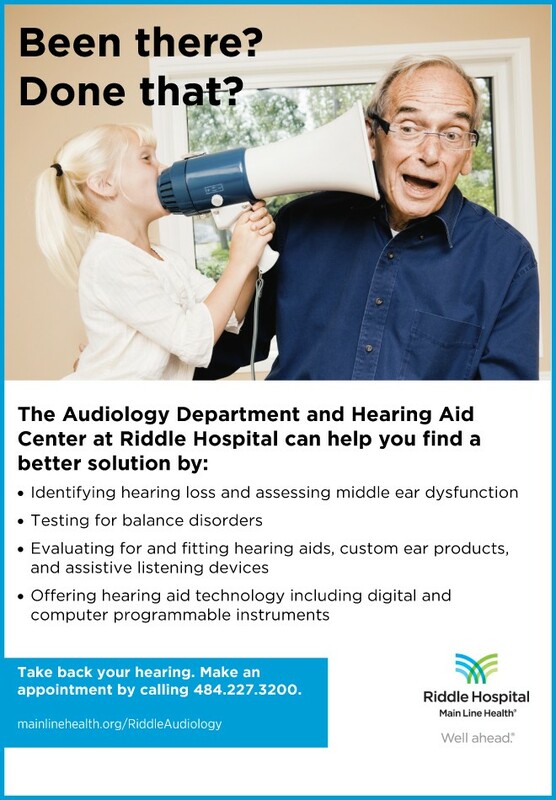 Audiologists at Riddle Hospital have been evaluating patients with balance disorders for over 25 years. Riddle Hospital has a state of the art balance laboratory that includes computerized video recording of nystagmus. Riddle audiologists will work as a team with your physicians and physical therapists to provide you with the best treatment for your balance disorders.